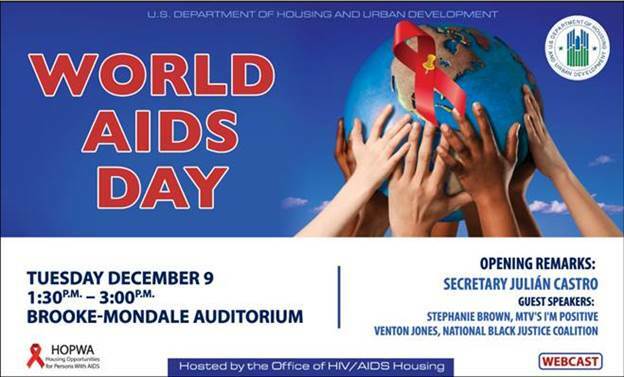 In commemoration of World AIDS Day, the Office of HIV/AIDS Housing will be hosting an event at the HUD Weaver Building on Tuesday, December 9th, 1:30 PM - 3:00 PM EST. We welcome grantees, project sponsors, and other stakeholders to join us for the event. This World AIDS Day commemoration will focus on stigma and discrimination associated with HIV. With 1.2 million Americans living with HIV, it is important for us to come together and reflect on the challenges HIV has presented to us as a society. Secretary Julian Castro will open the event recognizing World AIDS Day and HUD’s current efforts to respond domestically to HIV/AIDS. Two guest speakers, Stephanie Brown and Venton Jones, will also join the event to share their personal stories living with HIV, and how HIV stigma and discrimination have touched their lives. If you are interested in attending the event, please register now. For more information, please contact Lisa Steinhauer at Lisa.A.Steinhauer@hud.gov.